A reader of my Telegraph page wrote to me about my lawnmower, a Bosch lithium-ion cordless model that I have been using for about four years and about which I cannot speak too highly. Referring to it recently on my page, I mentioned the liberating effect that lightweight battery tools have on gardeners. I bought my first lithium-ion battery gadget five years ago – a hedge trimmer that is still going strong: no more wrestling with a filthy stinking heavy noisy petrol monster, nor the alternative – fiddling with infuriating and seemingly inevitable cord-splicing every time I cut my hedges. I have been an Battery Evangelist ever since. Bosch happen to be the market leaders in this particular field, so both mower and hedge trimmer are made by them. The reader, wanting to get a bit more low-down from me, wanted to know if I had been given my mower or whether it was on loan. It obviously never occurred to him that it was just ‘my mower’. 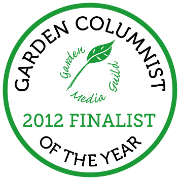 It would seem that now that more and more writing in newspapers and magazines is pretty much ‘advertorial’, the opinions and judgement of writers of columns like mine that occasionally mention gardening products and tools, and indeed the feature I did for a couple of years for the English Garden Magazine, may appear to the reading public to be very, very suspect. In fact, in the time I was the writer of the tool-testing feature for the English Garden, I had a remarkably free hand. I asked not to be told the price of the goods I was testing, so that I wouldn’t know which were the posh and expensive ones (although it was often obvious, of course), and it was left completely up to me to decide which was my ‘favourite’. It was, all in all, a bit of a dream job. On only one occasion since then have I been offered a significant ‘inducement in-kind’ – in the form of a discount on a product in return, presumably, for a big, glowing ‘mention’ in the feature. Nothing was specifically said about it, but the implication was clear. In the event, the item did get its mention, but even with the discount on offer the item was still extraordinarily expensive and – even if I had been tempted to ‘glow’ in print – I couldn’t possibly have afforded it. (The fact that garden writers earn a diminishing pittance for their work is another matter entirely, and one that I won’t air here). So how do we deal with all this? I admit I don’t really know how other writers carry on, but certainly for lesser fry like me there aren’t many ‘freebies’ kicking around these days anyway. When I need a major item for the garden I ask for – and generally receive – a trade discount. I am, however loosely it may be perceived, ‘in the trade’ after all. When I am sent something to ‘try out’, I am generally happy to do so. 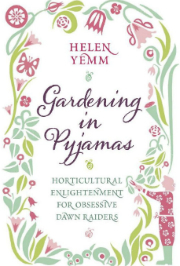 But only if I really like the product or gadget after using it and it is appropriate to write about it in the context of Thorny Problems (or whatever else I write, or when I am lecturing), will I personally recommend it to other gardeners. Very occasionally I take the opportunity in print to suggest improvements or modifications to products or packaging, and I like to think that in one instance at least, my comments have been influential. Anyway, in my view this is a reasonable deal, and one which keeps my integrity intact in a world of journalism that is increasingly dominated – you could say ‘tainted’ – by marketing. And I think, judging from my mail and from the general vibes I get, that the majority of my readers understand that this is where, somewhat naively perhaps, I stand. Commenter Stephanie Donaldson is obviously a dedicated PP like me, and on her blog, ‘The Enduring Gardener‘, there are some pictures to inspire, of extremely tasteful garden posies she has put together – and a slightly more lavish thing for her recent wedding. Do have a read of that too. Two days ago, early in the morning I was carefully walking along the edge of the pond (precious primulas in full sail to my left, water to my right) in order to haul out some of the mass of oxygenating weed that was threatening to engulf the pump. I had just wandered outside, having completed the ‘weekly tips’ section of my Telegraph column, in which I including advice on the need to keep pond weed in check at this time of year. I was inappropriately wearing slippers (as you do) and yes, I slipped. My right shin scccccraaaaped down the brick edge of the pond and into the water. When my slippered foot hit the sludge on the bottom of the pond, it skidded sideways, and as I struggled to recover my balance, I thwacked the inside of my right knee against the edge of the pond, and into the small protruding overflow pipe that sticks out of the brickwork into the water (supplying constant moisture to primula bed). My right shin, from ankle bone to knee is totally bruised and grazed – hot, throbbing and bright scarlet. The entire ankle and calf have swollen to what looks like twice their size. I have a 5″ diameter dark purple mottled bruise (a haematoma, the nurse called it) on the soft bit on the inside of my knee and a similar large purple patch on the bony bit under my kneecap. I am now wearing an elastic tubigrip bandage from the arch of my foot to above my knee. I am on penicillin and heavy duty anti-inflammatory/painkilling drugs and had to have a tetanus jab as a precaution. I am not supposed to drive till things improve, and am told to keep my right foot above the level of my heart whenever possible, which ought to be most of the time. And until the heat and swelling on my leg starts to subside, I should if possible strap an ice pack to it made out of a tea towel and a bag of frozen peas. I am told it might be some weeks before the swelling goes down and my leg returns to normal, during which time the colour from the healing bruise will gardually drain down to my foot. Attractive. Oh yes, and – just a small additional bit of sadness to the outcome: quite a lot of the primula stems bit the dust, too. All this because I slipped – well, actually only one leg of me slipped – into a small garden pond barely 18″ deep. Fellow early-morning slipper-wearing pond-lovers, of which I suspect there are legion, consider yourself warned. For my part, I am tempted to only undertake weed-removal duties in future if wearing full protective gear including flippers and a snorkel, although I consider installing a life belt by the pond a step too far. I am always surprised to find myself in small gardens with no chairs or seats apart from the obligatory dining ones by the house. You walk up them… and you walk back. And that’s it. Absolutely nowhere for quiet contemplation. Admittedly, my garden has an overabundance of seats, many of them elderly rustic chestnut things, relics from my former spacious garden. 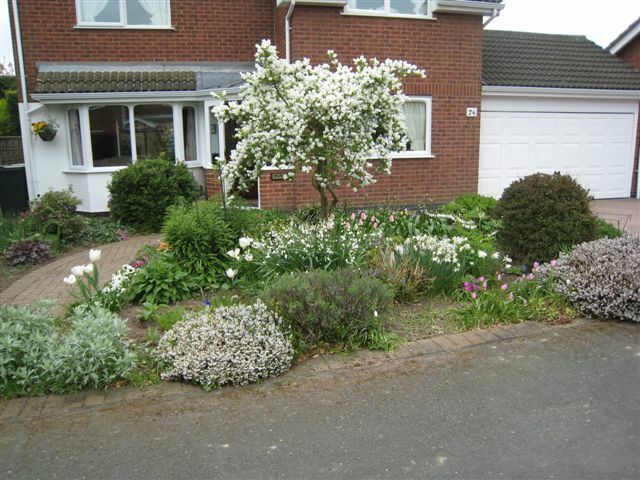 Some of them are tucked away under trees where little else will grow, areas that would otherwise be somewhat unsightly. A bench or chair so placed kills two birds with one stone – providing a something pleasing to look at from elsewhere in the garden, and somewhere on which to perch while enjoying looking the good bits of it. The avian references are apt, as it happens. I have just been scrubbing a year’s worth of guano off my chairs and benches in preparation for my open afternoon tomorrow and subsequent other visitors. It simply wouldn’t do for the assorted bottoms of Wadhurst and its environs to go home with bird-poo embellishments. So, now the garden visiting season is in full swing, and by way of encouragement to others who perhaps have gardens where seating is a bit thin on the ground – or indeed, tricky areas under trees that need a bit of dressing up – I will include here a selection of pictures that should go under the heading of ‘Seats that are rarely sat on most for of the year’ since I have to admit that the moment I sit on them myself, I immediately see something that needs propping up or deadheading. 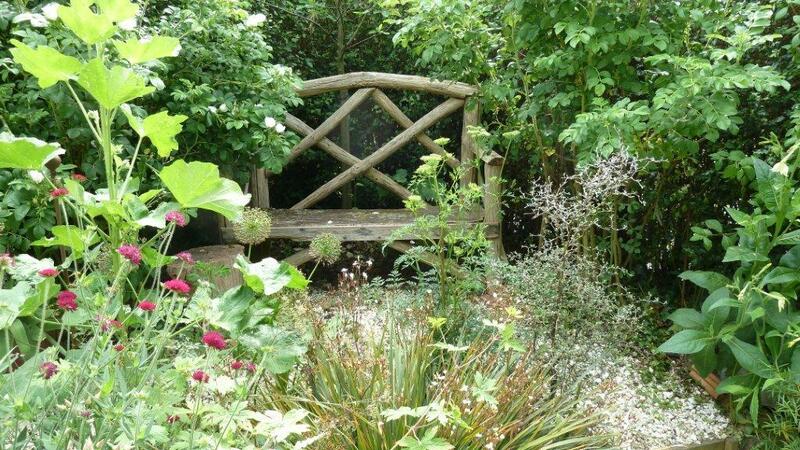 …between 2 pm and 6 pm on Sunday June 5, as part of the Wadhurst Open Gardens 2011 weekend. Other lovely gardens of all shapes and sizes are open as well, of course, during both the Saturday and Sunday afternoons. Tickets cost £5 from Carillon Cottage (the parish office near the post office bang in the middle of Wadhurst High Street). I am keeping my fingers crossed for good weather – and less of the ghastly wind that has been rocking things around for the past week. I have been having a bit of fun with my Telegraph page (a gardening agony column) recently. Totally fed up with readers sending me endless pictures of crisply dying bay trees (sometimes without even any accompanying question), expecting clairvoyancy on the subject of their teetering-on-the-brink hydrangeas and whingeing about myriad buds dropping off camellias and about primrose-vandalising sparrows, I blew a fuse (partially extinguished pre-publication by my Tact Inspector, Telegraph Gardening‘s editor Joanna Fortnam).